The ‘Brand’ Poliedrica was born in 1996, but our experience in design with plexiglass ( methacrylate = PMMA ) began already in 1973 becoming today is a guarantee of quality. 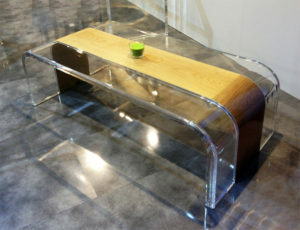 It is mixing wisely important ingredients like high quality materials, passion and experience, that we are able to design and produce our collections of furniture in plexiglass (or Plexiglas or Altuglas, according to different trade names). We also realise decorative and artistic objects and accessories in general, all made in acrylic of the highest quality: cast methacrylate, PMMA 100% MADE IN ITALY. 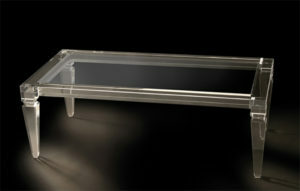 In general, we offer three different main lines of acrylic furniture. 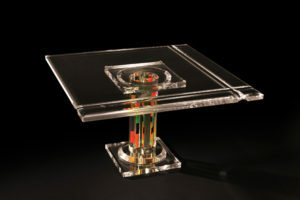 A so-called ‘classic’ collection, consisting mainly of transparent plexiglas furniture highlighting the brightness, the lightness and the elegance of the material – as well as a line of ‘artistic or creative deisgn’ where, in order to create our items, we use acrylic of different colors, working like a 3D mosaic. This is a fairly eclectic line, very colorful and joyful. Last but not least, the collection called ‘Plexilo’, where we mix acrylic with wood in, let’s say, a modern interpretation of the classic, combining the beauty, lightness, and brightness of methacrylate with the traditional warmth and strength of wood. Our working methods and as well as the materials we use are 100% Italian in accordance with the highest standards of quality of Made in Italiy. We are located in Pomezia, near Rome.